Joe Kelly started for Pawtucket and earned his first win since being sent to the PawSox. He went five innings and allowed two earned runs, struck out seven, and walked just one. His ERA with Pawtucket is now 2.84. Dayan Diaz lowered his ERA to 2.06 by pitching three shutout innings in relief. Pat Light closed it out with a scoreless ninth. The Sea Dogs received solid pitching, but couldn't get the bats going as the dropped a tight one on a walk-off. Danny Rosenbaum started for Portland and went the first four innings. He allowed eight hits and one walk, but was able to limit the damage and gave up just one earned run. Heri Quevedo made his second consecutive relief appearance after making six starts. He did not allow a run or a hit in two innings of work. Kyle Martin pitched 1 2/3 innings of scoreless baseball before John Cornely walked in the winning run after walking the bases loaded in the ninth inning. Manuel Margot, Reed Gragnani, Carlos Asuaje, and Sam Travis (1-4 hitters in the lineup) each went 1 for 3 with a walk. Travis had the only extra base hit with a double. Salem also struggled to get offense going. Mario Martinez provided the lone run by himself, hitting his fourth home run of the season in the seventh inning. Kevin Heller and Wendell Rijo also added singles and stolen bases. Daniel McGrath took the loss, going four innings and allowing four runs (two earned) on nine hits. Brandon Show pitched four great innings of relief. He didn't allow a run, gave up one hit, and struck out four. Mike Adams also threw a scoreless ninth. The Drive had an interesting, but very effective, night offensively. They pushed across 14 runs, but just nine of them were earned. They also scored three runs on bases loaded walks, one run on a hit-by-pitch with the bases loaded, and another on a passed ball. Javier Guerra stayed hot by going 2 for 3 with two walks, two RBI, and four runs scored. He also showed off his skills at shortstop, as noted by SoxProspects.com's own Ian Cundall, who will be in Greenville through the weekend with Chris Hatfield. Danny Bethea went 2 for 2 with three RBI and Mike Meyers added his fifth home run of the year. Reed Reilly got the win, but it wasn't pretty as he gave up six earned runs in four innings. Carlos Pinales gave up one run in three innings and Michael Gunn went 1 1/3 innings and gave up a run. Ryan Harris closed it out by going the final 2/3 of an inning. The Spinners banged out ten hits and mounted a rally in the bottom of the ninth but came up just short. Lowell entered the ninth down by two runs, as Tate Matheny singled home a run to make it 4-3. However, Austin Rei flied out with the tying run on third to end the game. Andrew Benintendi had a 2 for 5 night with a triple and an RBI. Mitchell Gunsolus and Isaias Lucena had two hits each as well. Javier Rodriguez took loss by going 4 2/3 innings and surrendering three hits, four walks, and three earned runs. Daniel Gonzalez pitched well in relief, allowing just one run in 3 2/3 innings. Daniel Zandona finished the final 2/3 of an inning. Red Sox starting pitcher Gerson Bautista ran into trouble in the third inning, giving up seven in the frame. Brad Stone, Adam Lau, Nick Duron, and Carlos Garcia combined to go the final 5 2/3 innings without allowing a run. Jerry Downs had two of the Red Sox four hits, including his second home run of the year. Tyler Hill singled, walked, and drove in a run as well. Jose Zacarias turned in a great start, but the bullpen faltered and the Sox lost 6-1. Zacarias went five innings and did not allow a run or a walk. He struck out four. Fransisco Tena took the loss, giving up two runs in just 1/3 of an inning. Warlyn Guzman pitched 2 2/3 innings of scoreless ball before Roberto Medina gave up four runs (two earned) in the ninth. Marino Campana went 1 for 3 with his second home run and a walk. Keibert Petit also went 2 for 3 with a walk. Darwinzon Hernandez also pitched very well and moved to 3-0 on the season. He pitched five scoreless innings and surrendered just three hits and one walk. He punched out six and lowered his ERA to 2.02 on the year. Angel Padron, Nicolo Clemente, Ryan Oduber, and Ritzi Mendoza each tossed an inning of relief to finish off the game, with Mendoza earning the save. The Red Sox had 10 hits, all of which were singles. Imeldo Diaz went 3 for 5, Marcos Martinez went 2 for 3 with a walk, and Juan Barriento went 1 for 5 with two RBI. 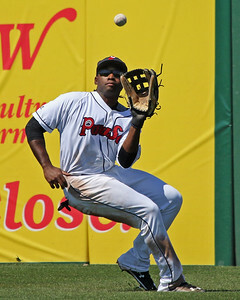 Player of the Night: Jackie Bradley Jr.'s terrific season for the Pawtucket Red Sox continued last night. He went 3 for 5 with two home runs, giving him a total of seven on the season. He is now batting .311/.389/.471 on the year.